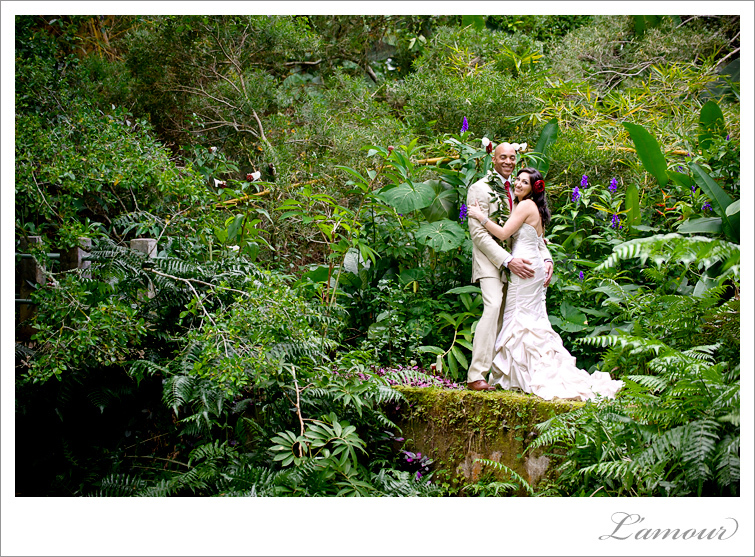 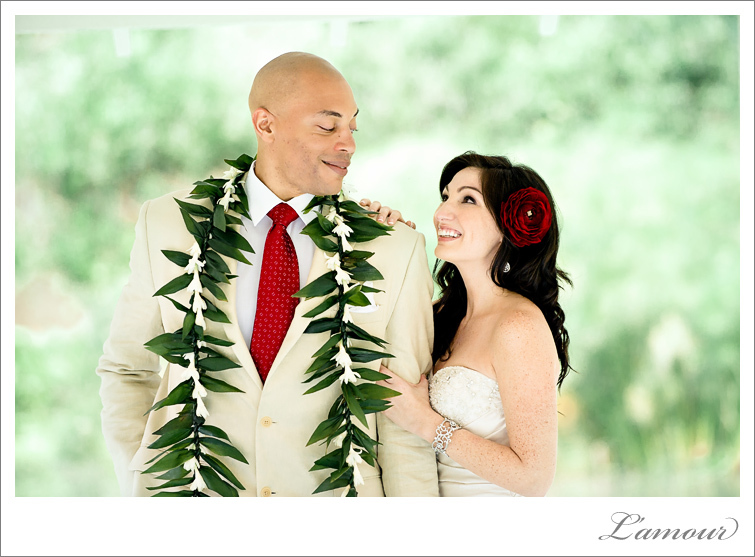 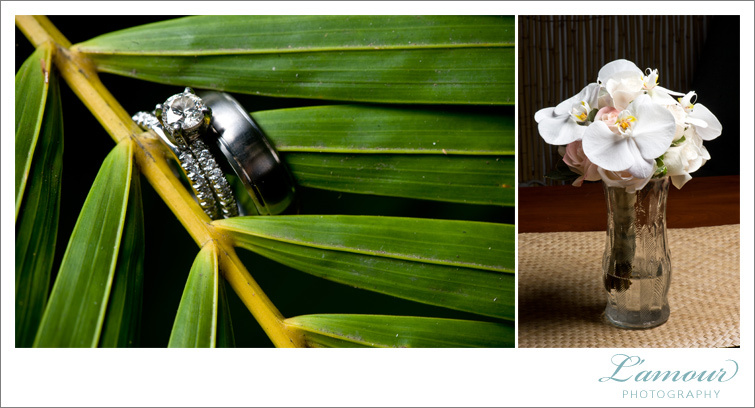 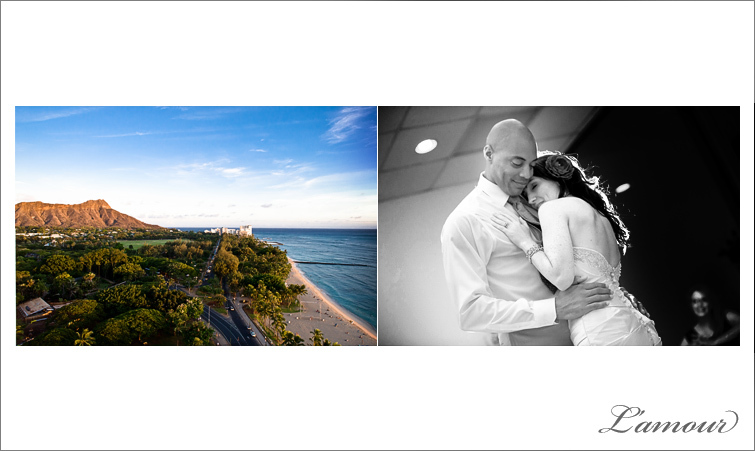 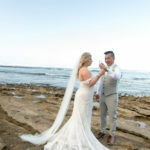 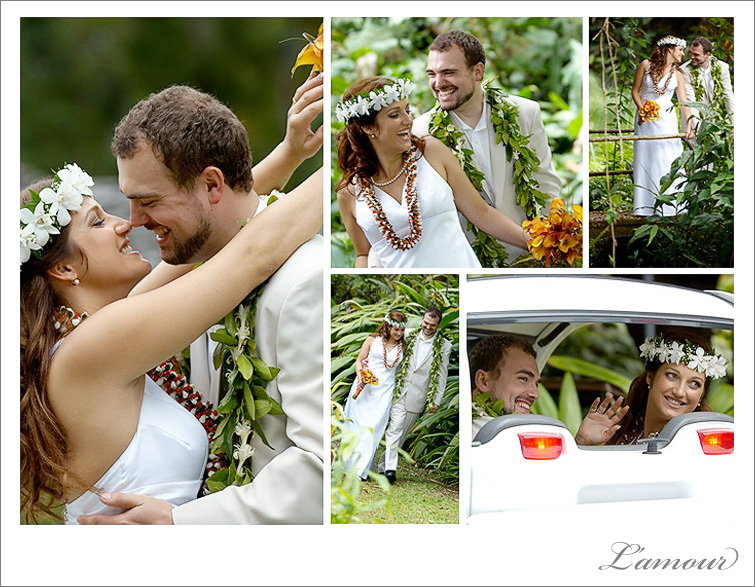 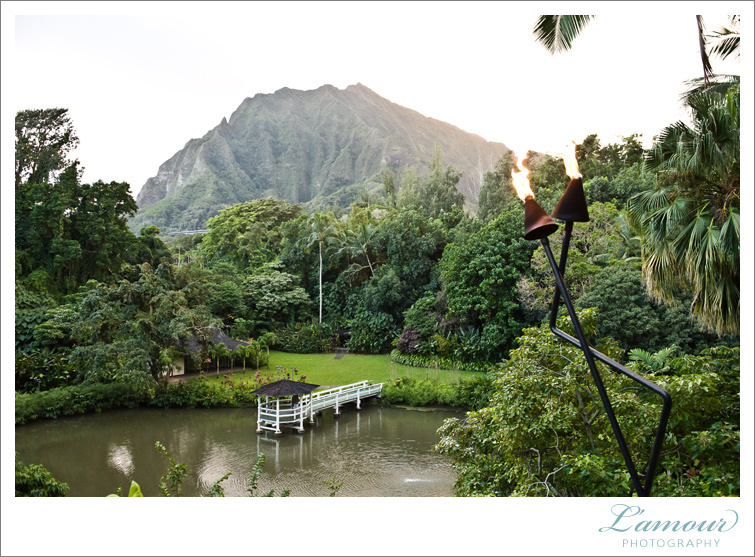 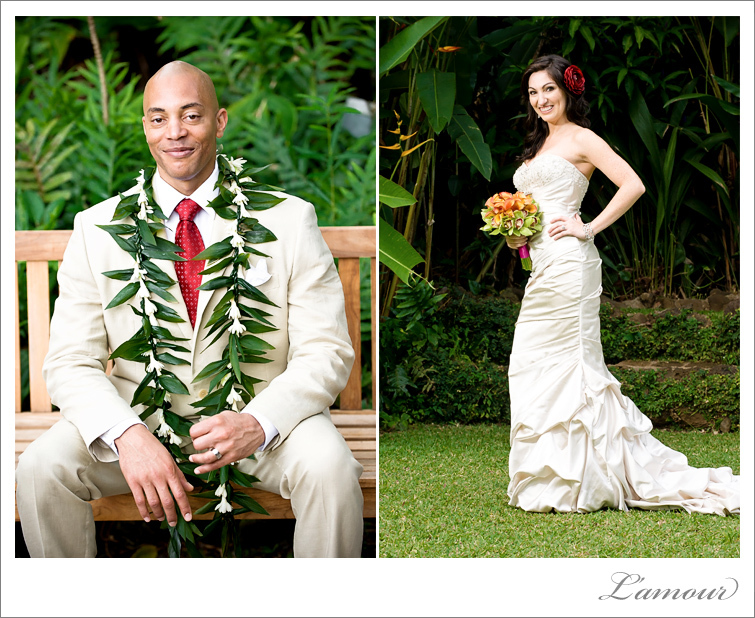 Kristen and Michael enjoy nature and the outdoors so when they decided to have their wedding in Hawaii they chose Haiku Gardens in Kaneohe as their ideal Oahu wedding venue. 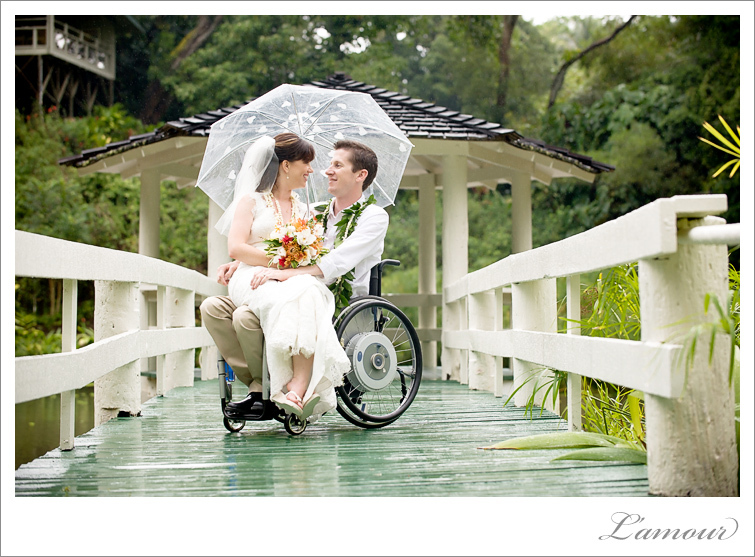 This sweet couple came prepared for their Hawaii wedding and had a cute clear umbrella with white hearts on hand when they received some lucky rain on their wedding day. 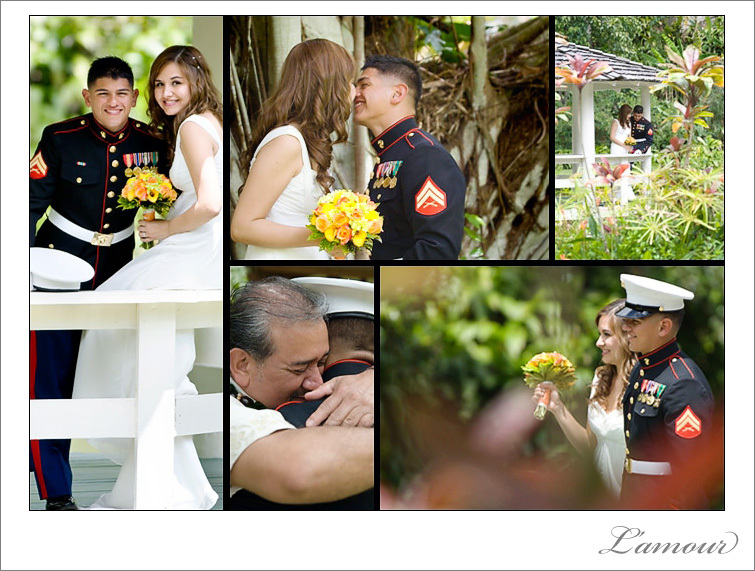 Congratulations to this wonderful couple. 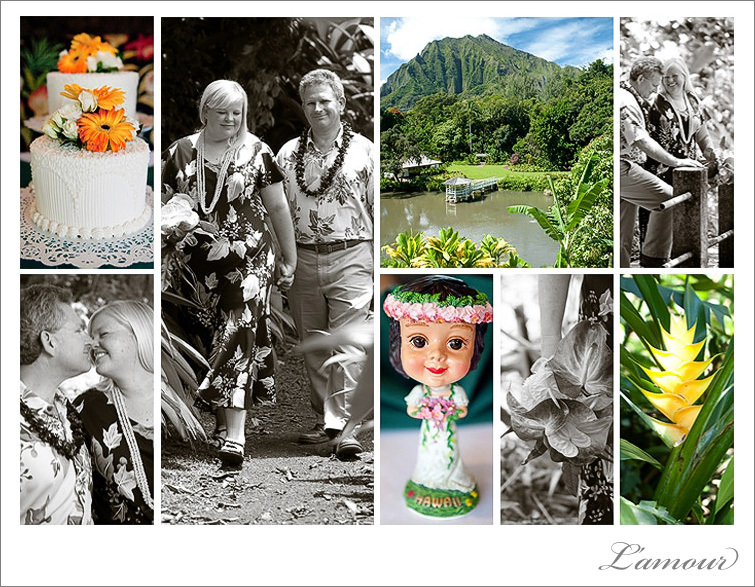 We wish you many great adventures from here on out! 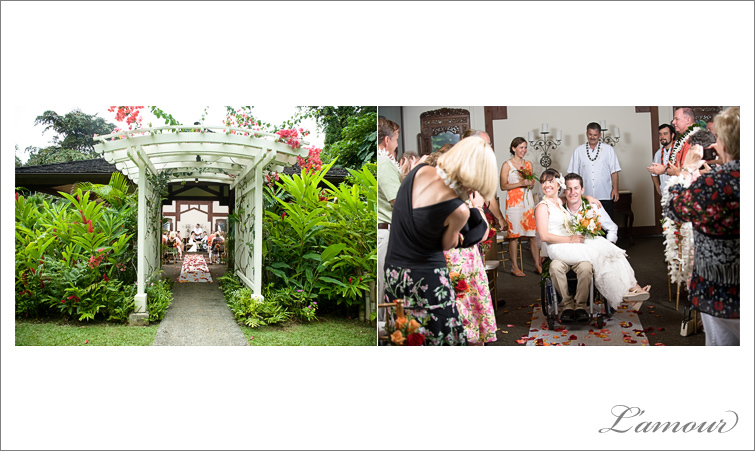 This Hawaii wedding featured red and orange wedding details including glass vases of orange and red roses hanging from the ceremony gold chivari chairs. 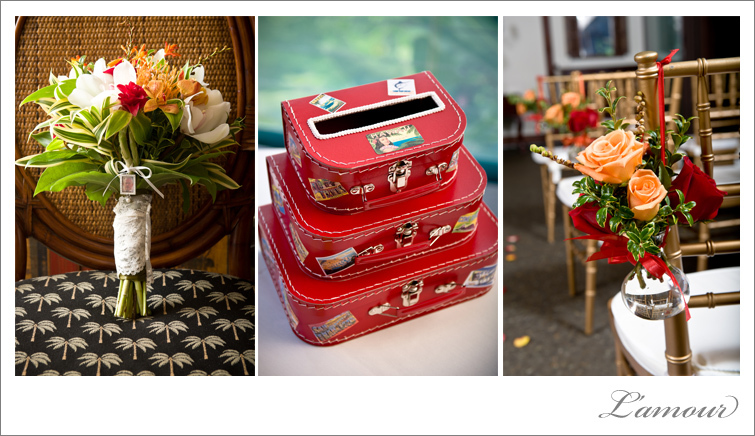 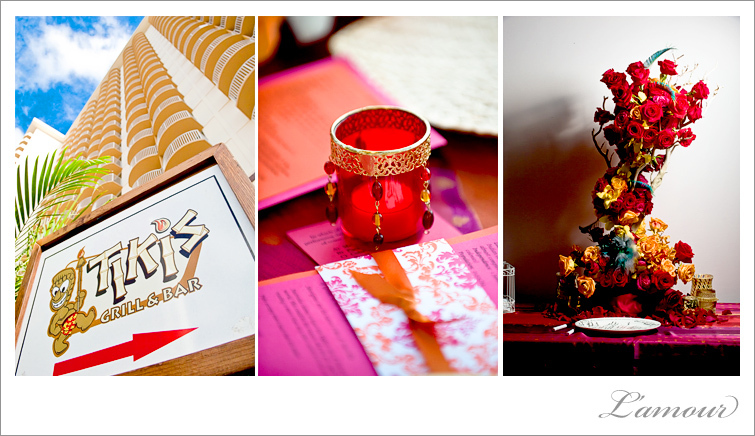 The wedding card box was made of red leather suitcases embellished with vintage style stickers of the various places they love. 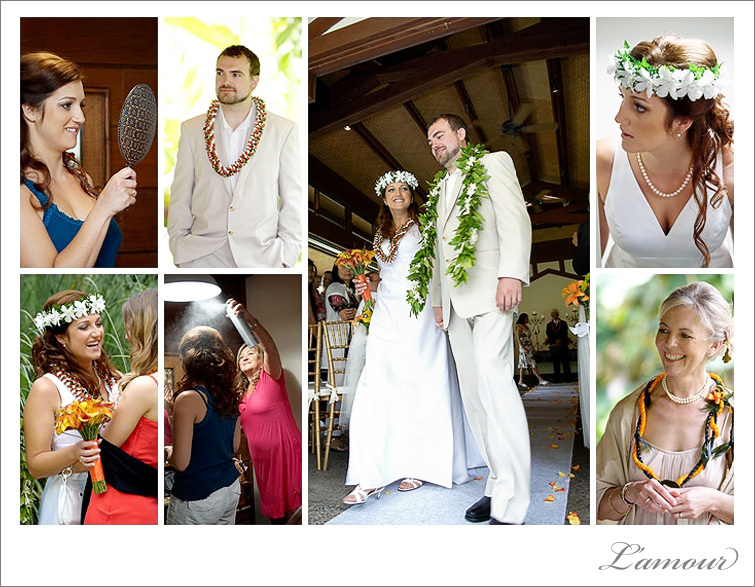 The bride’s bouquet had red, white, and orange tropical flowers with lace ribbon and tiny framed photos of relatives. 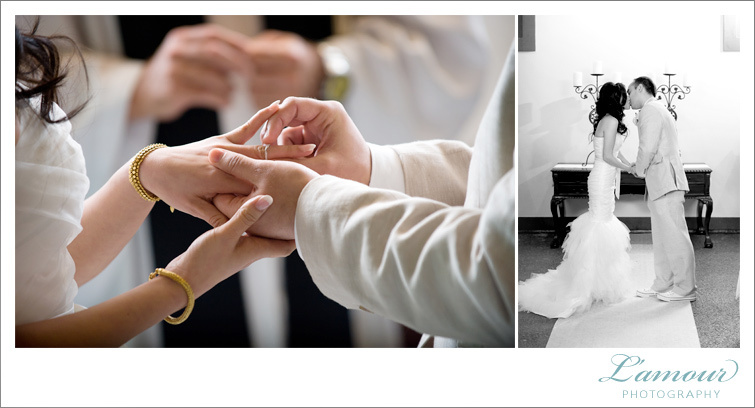 This is a subtle but touching way of keeping your loved ones close on such an important day. 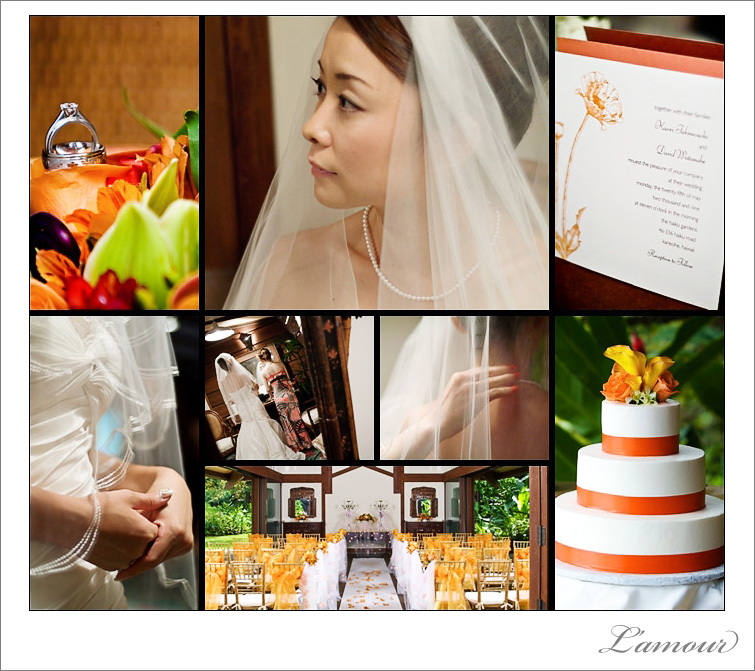 This citrus themed wedding had such a cute and lively feel. 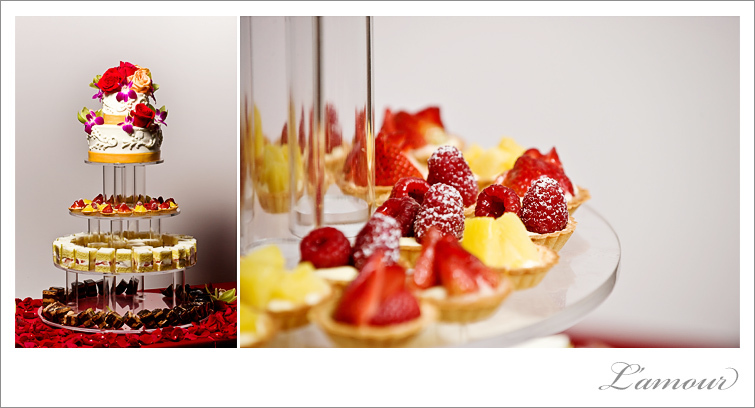 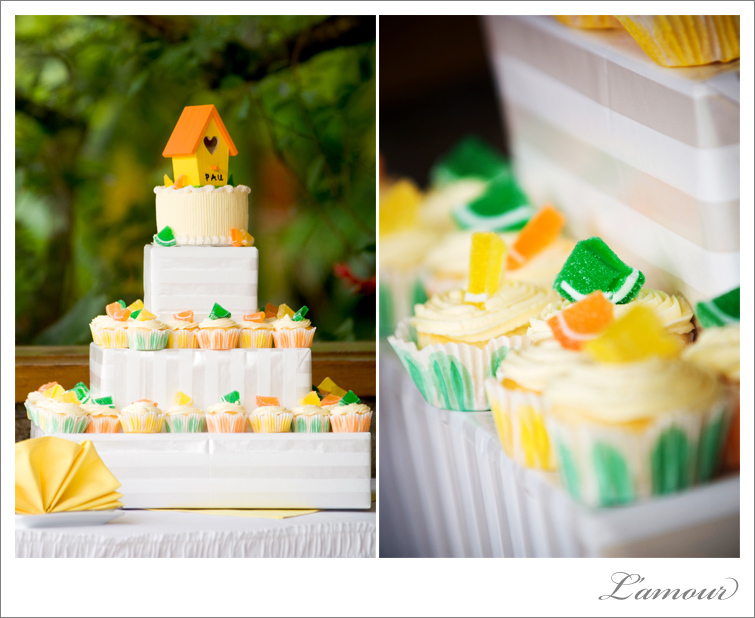 The citrus theme was used on the cupcake wedding cake tiers by accenting the cupcakes with little citrus candy toppers. 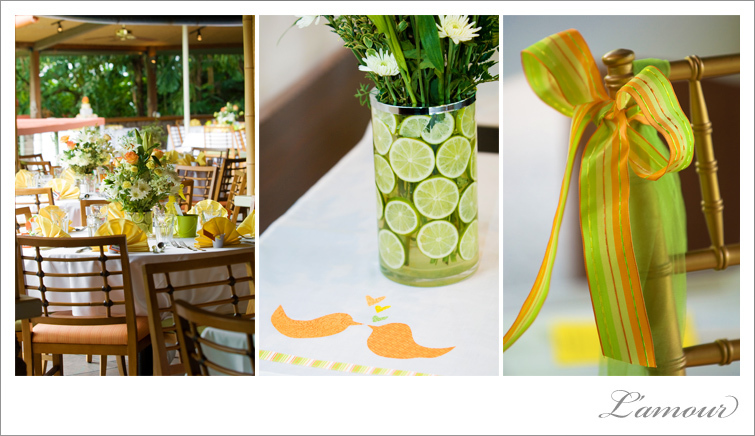 The centerpieces also incorporated citrus in lining the vase with slices of real lemons and limes. 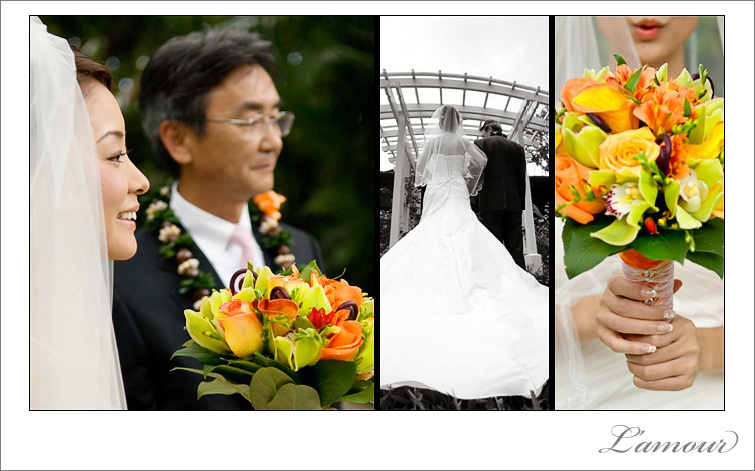 The vases used had an outer compartment held the lemon and lime slices, with the inner section of the vase was filled with bright orange and yellow flowers to compliment the theme. 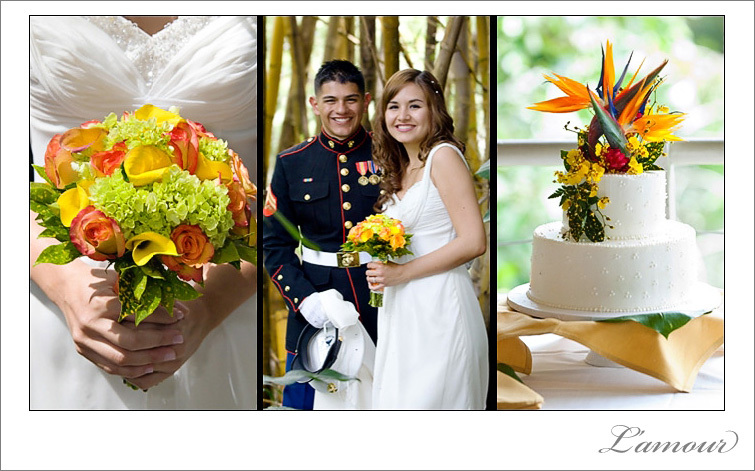 In addition to the citrus theme with the yellow, orange and green wedding color scheme the happy bride and groom also utilized little bird motifs. 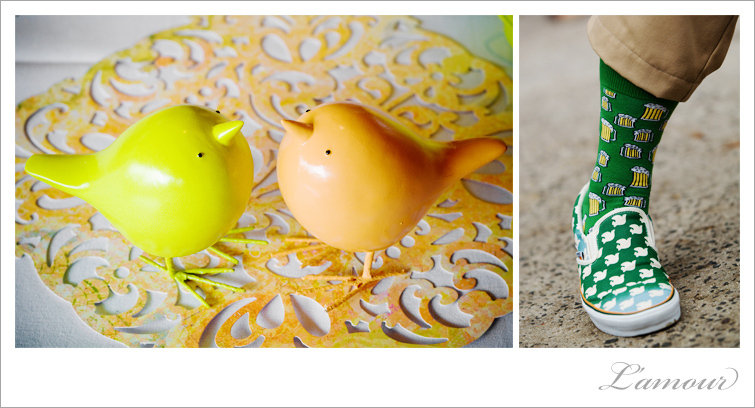 On the top on the tiers of cupcakes, the cake topper was a tiny birdhouse with the family name painted on it. 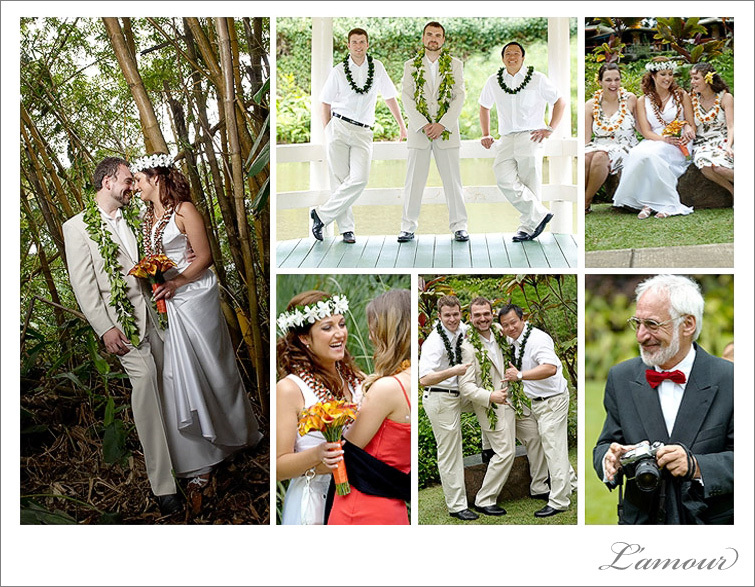 To be part of any couple’s wedding is always such a great honor. 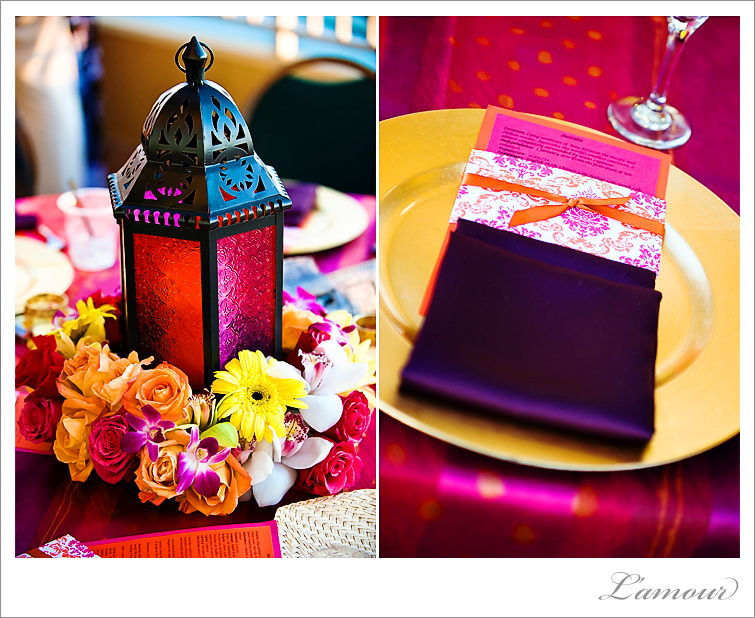 Each wedding is so unique and offers so many insights into other religions and cultures for us. 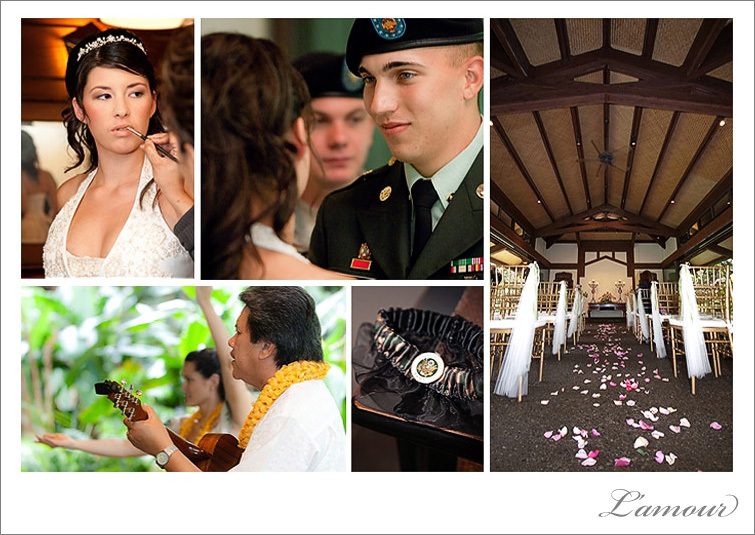 We have been fortunate to be a part of many different religious ceremonies including Catholic, Buddhist, Muslim and Mormon and cultural traditions including Japanese, German, Australian, Chinese, Hawaiian, Afghani, and Filipino . 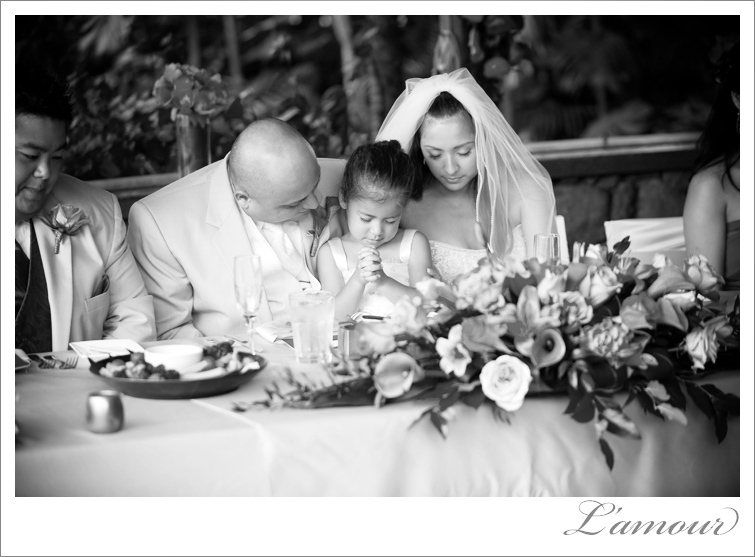 As today is Easter, we have chosen a photo for our “Daily Shot” that exudes faith and family. 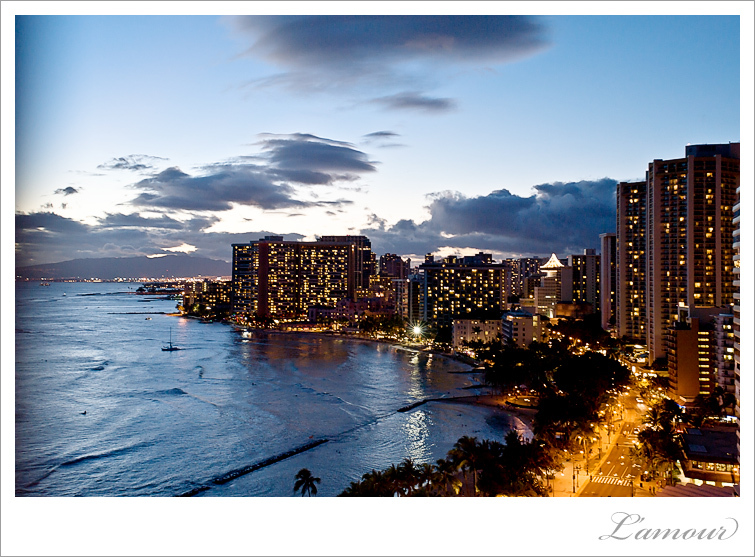 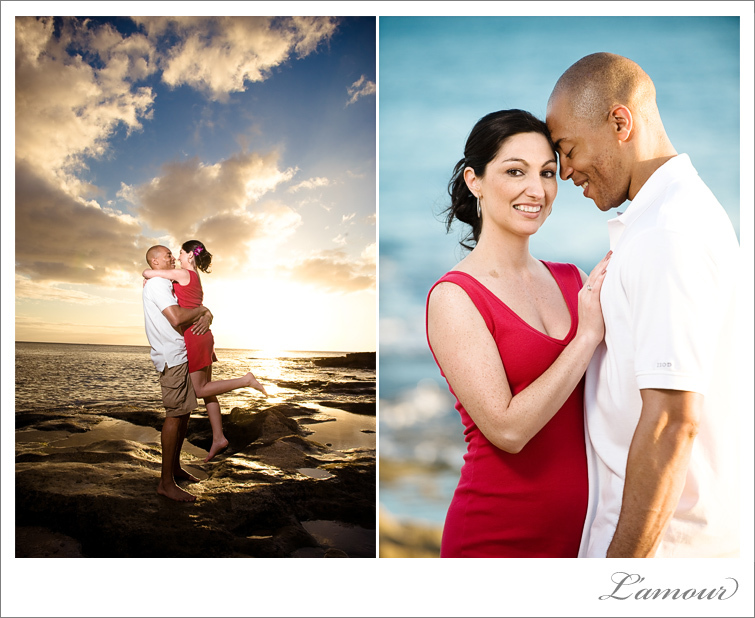 Happy Easter from the team here at L’Amour Photography! 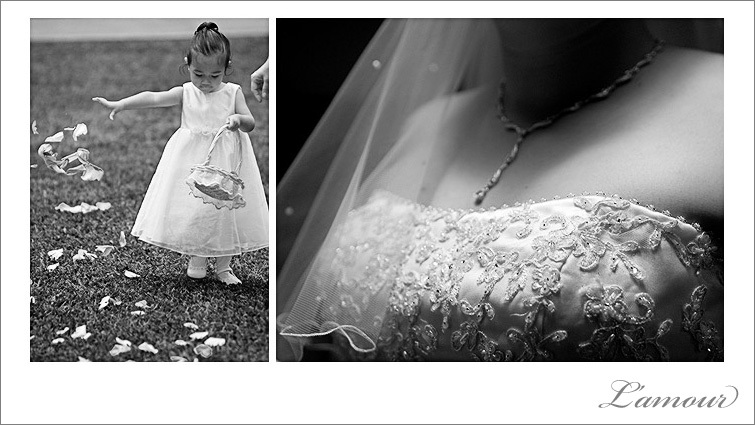 There are moments as a photographer that just strike you and you have to drop what you were doing and take advantage of the situation. 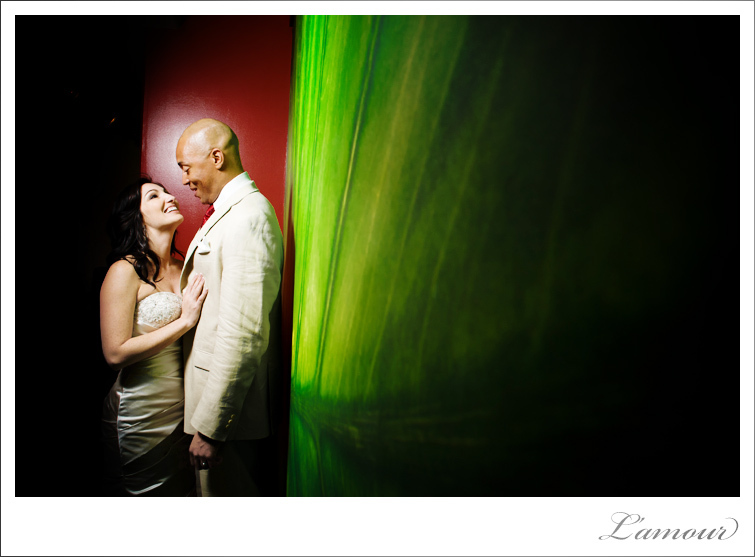 This was one of those moments. 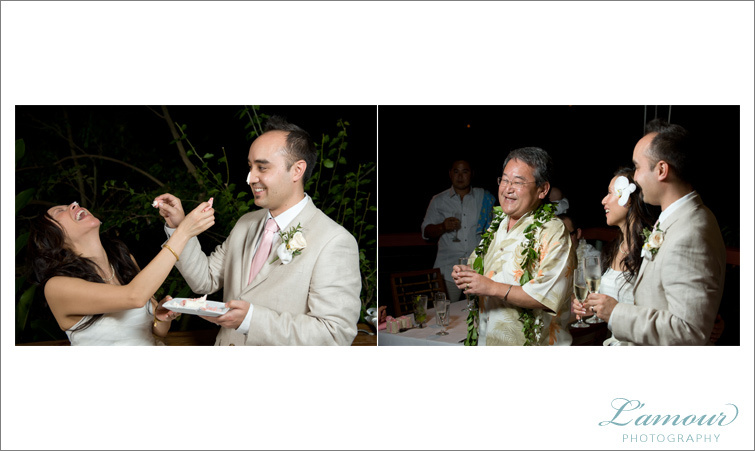 As the sun set over the Ko’olau Mountain range at Haiku Gardens in Kaneohe Hawaii, the sunbeams began to dart through the trees and created the most ethereal glow around this beautiful bride and groom. 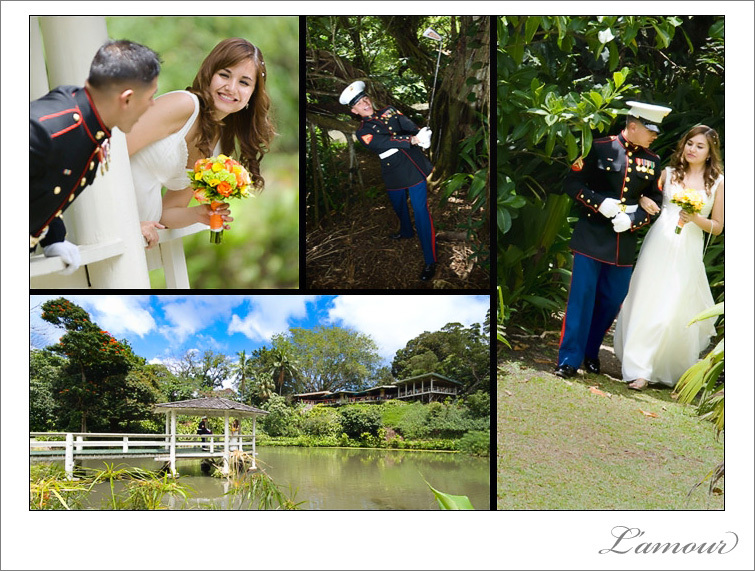 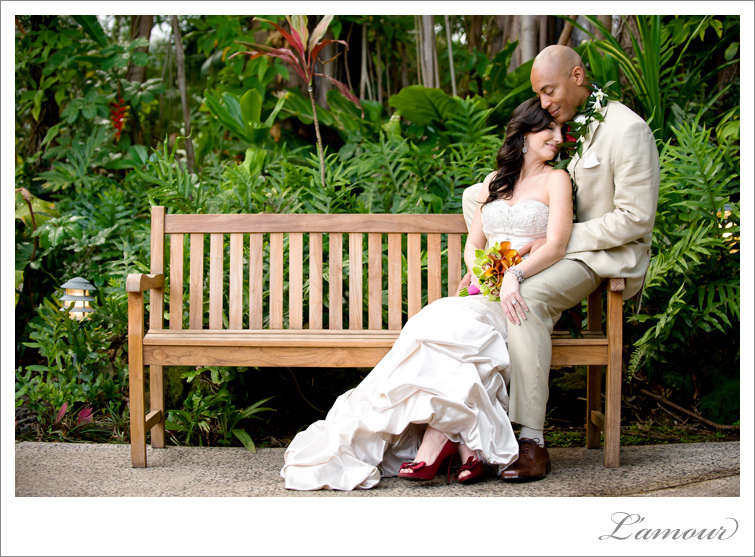 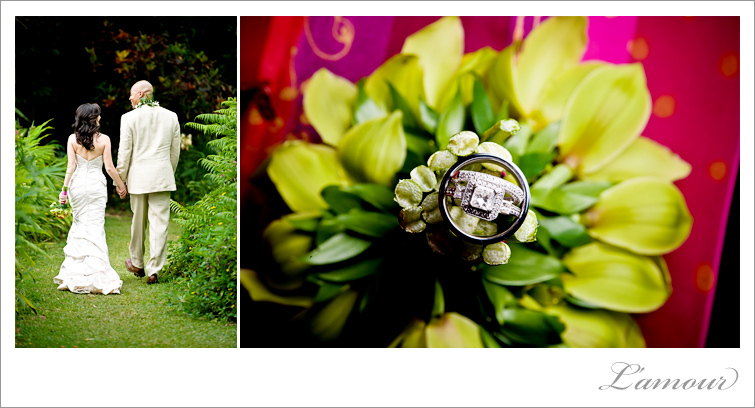 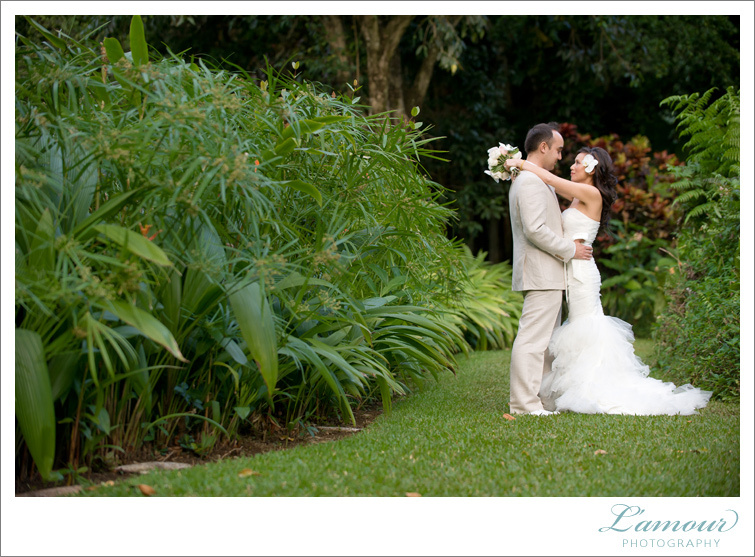 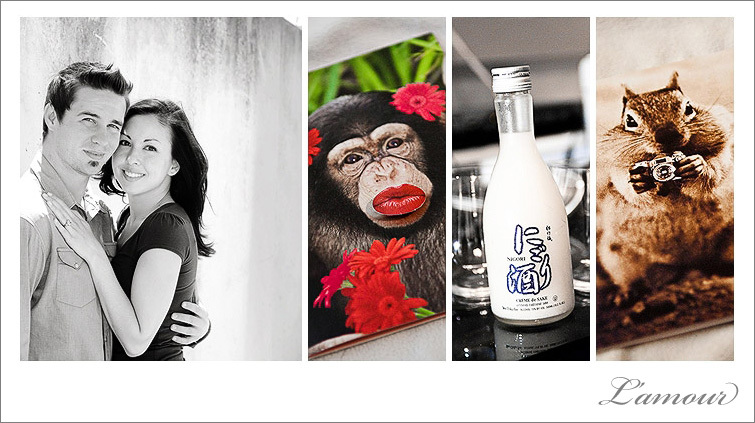 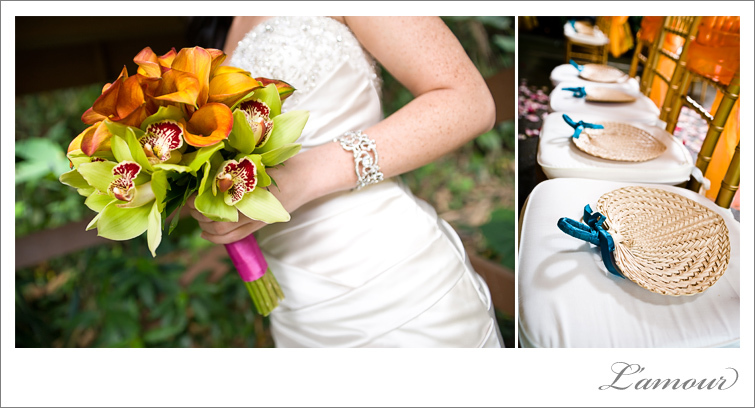 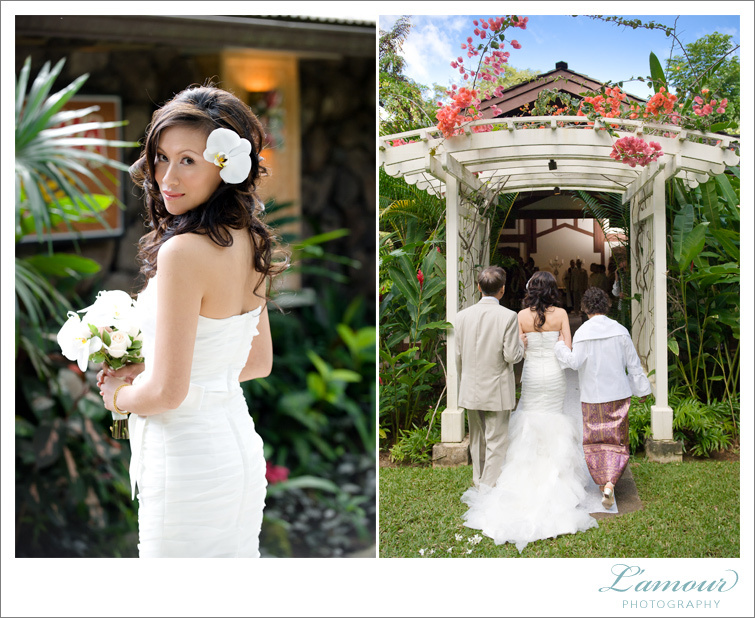 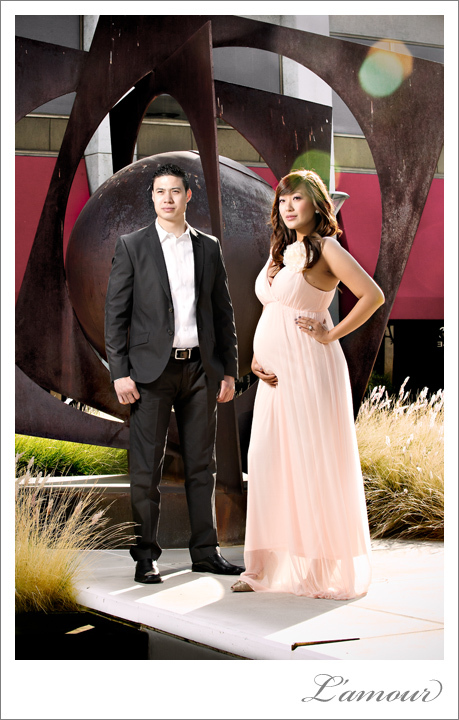 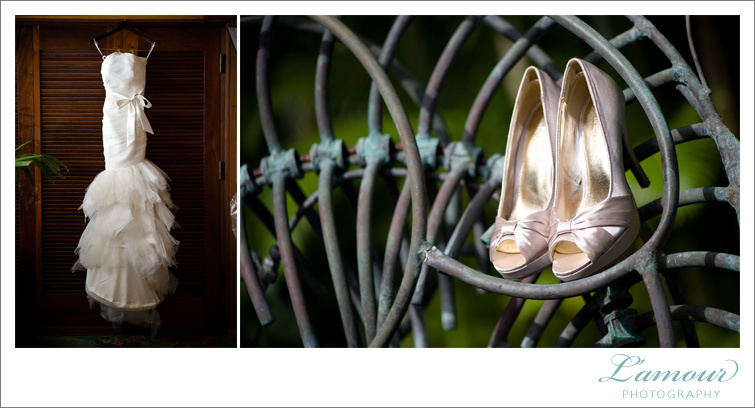 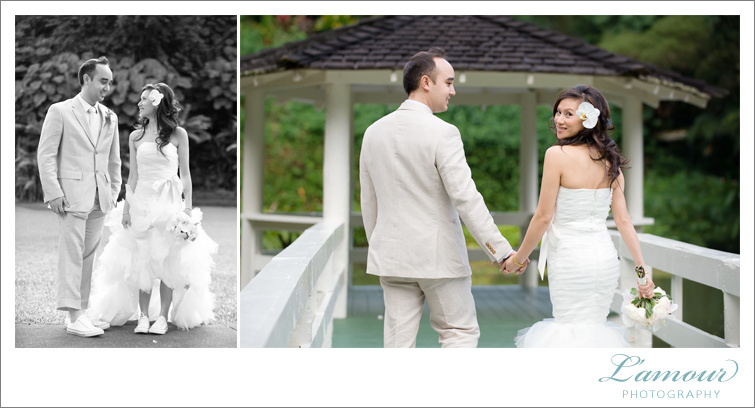 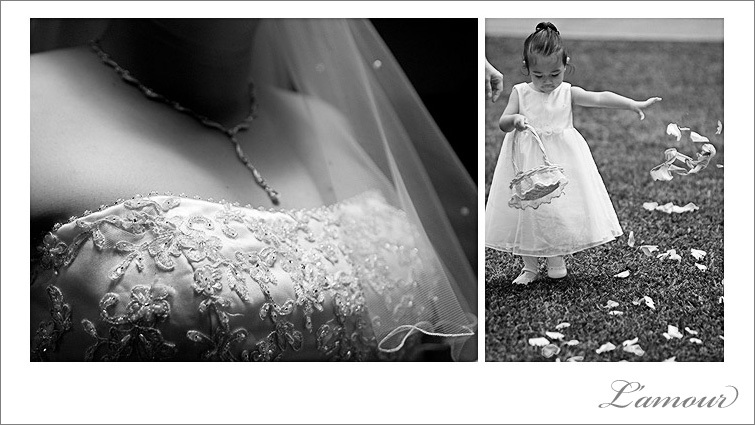 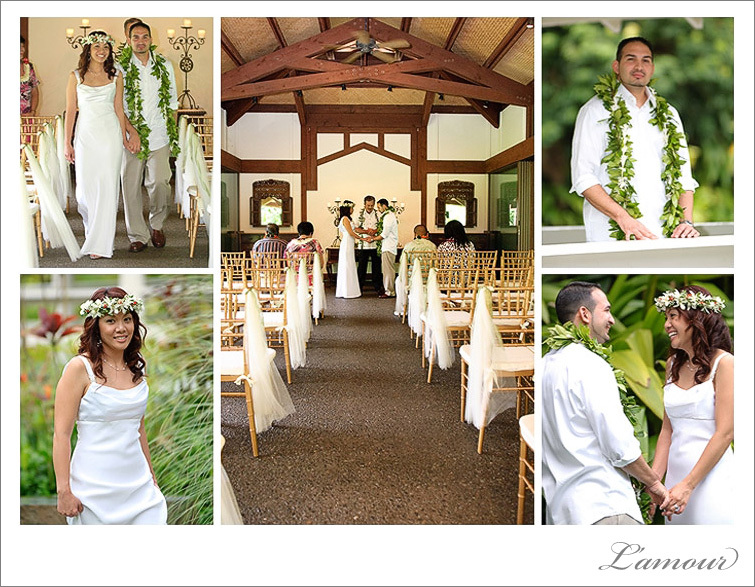 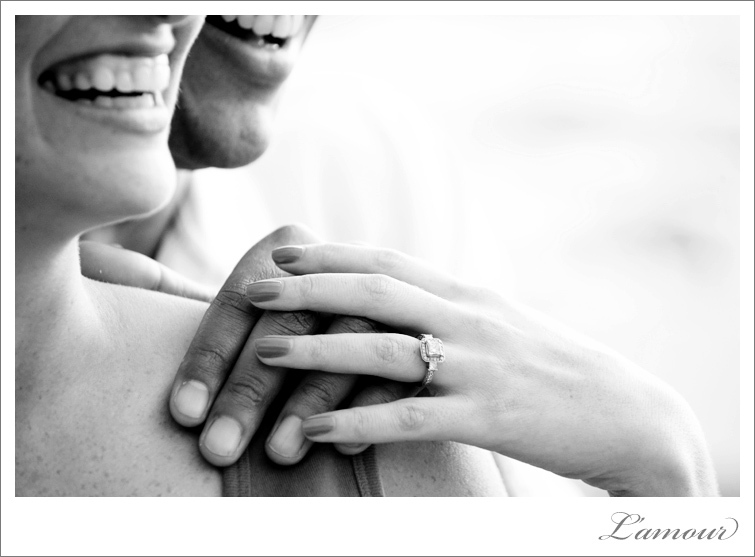 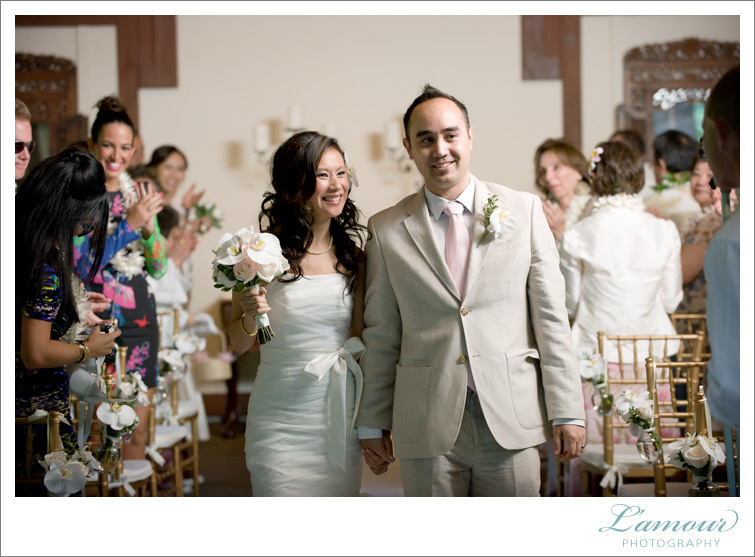 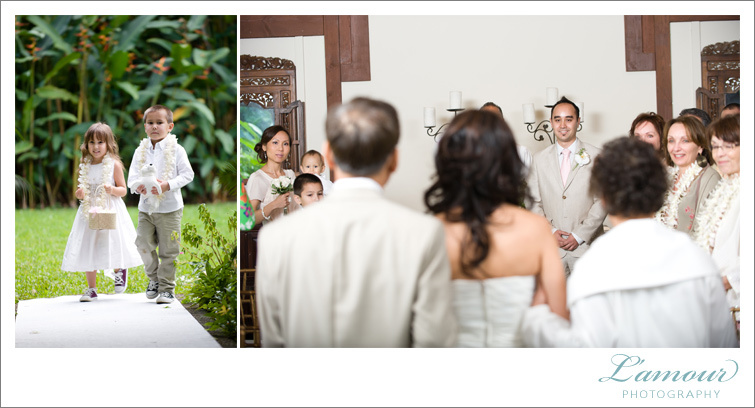 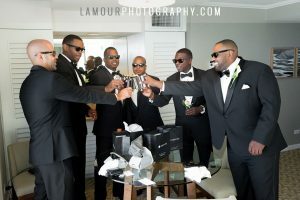 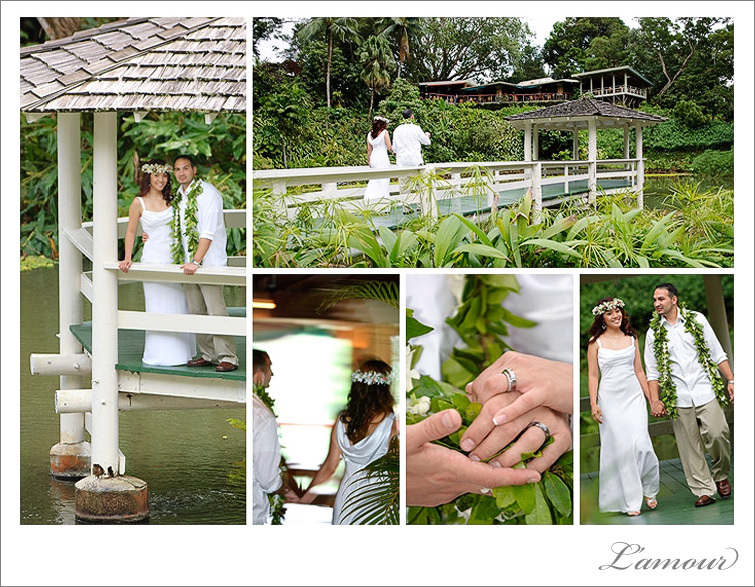 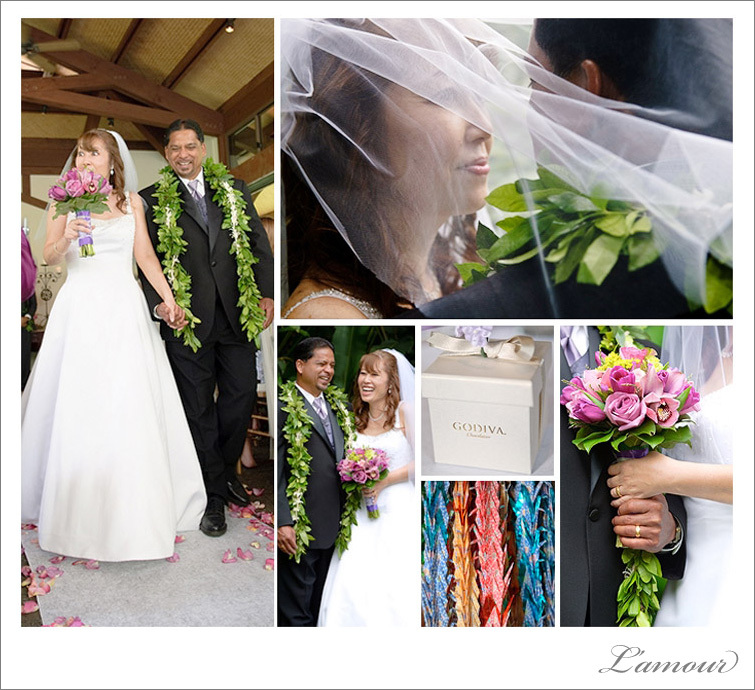 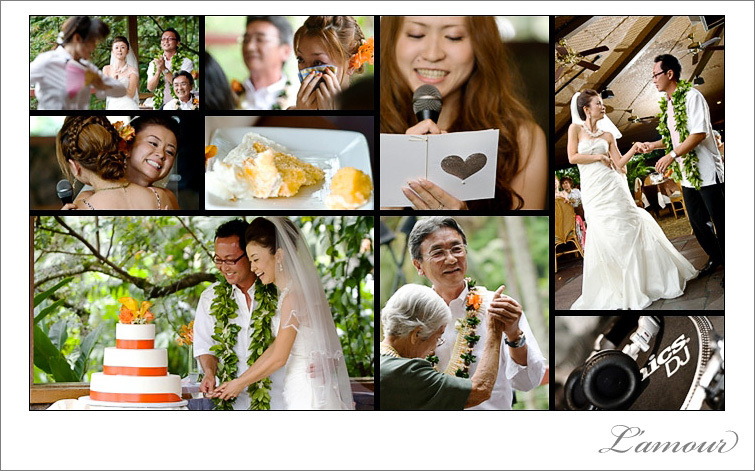 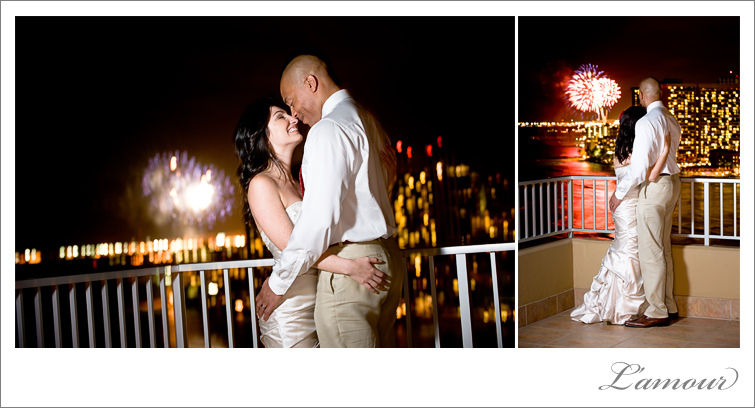 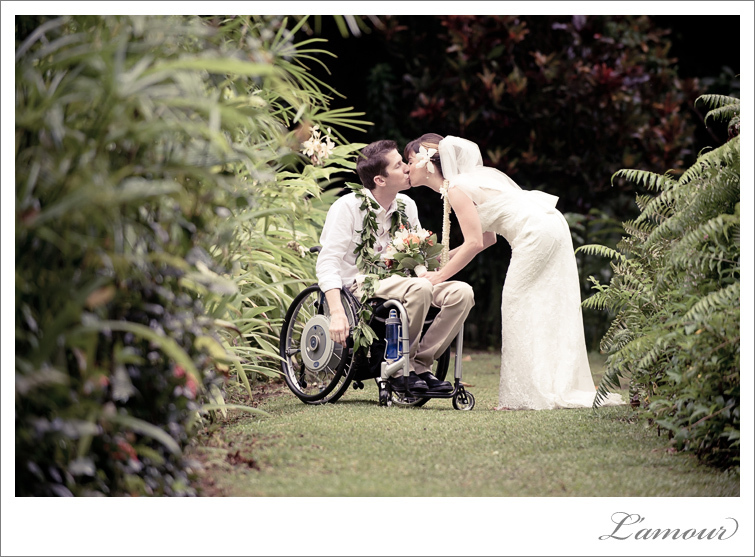 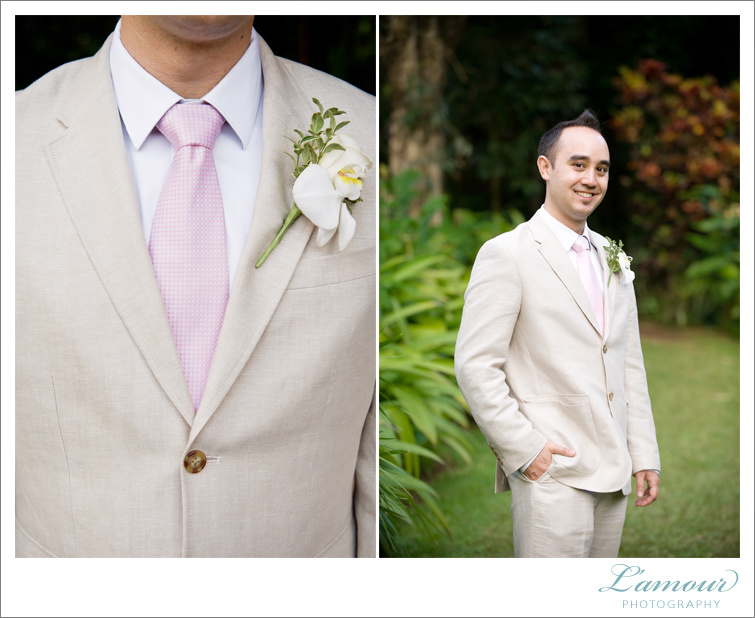 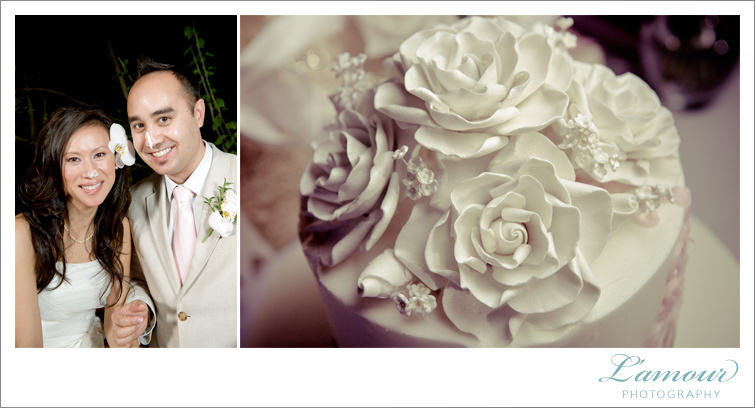 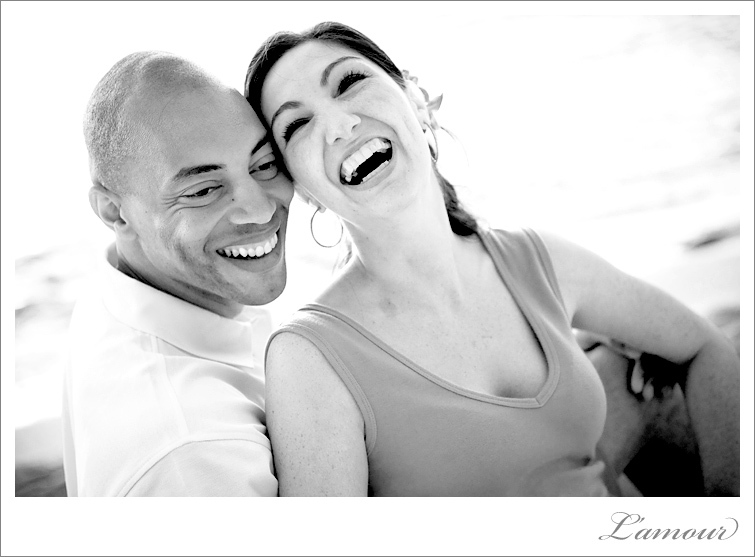 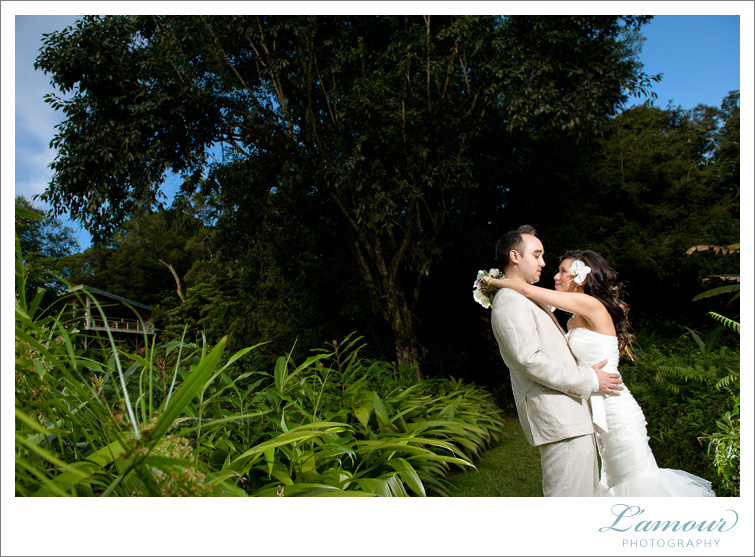 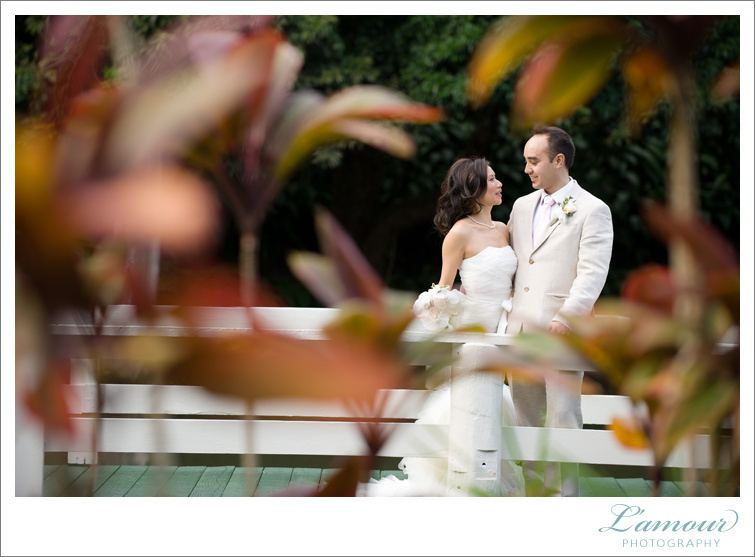 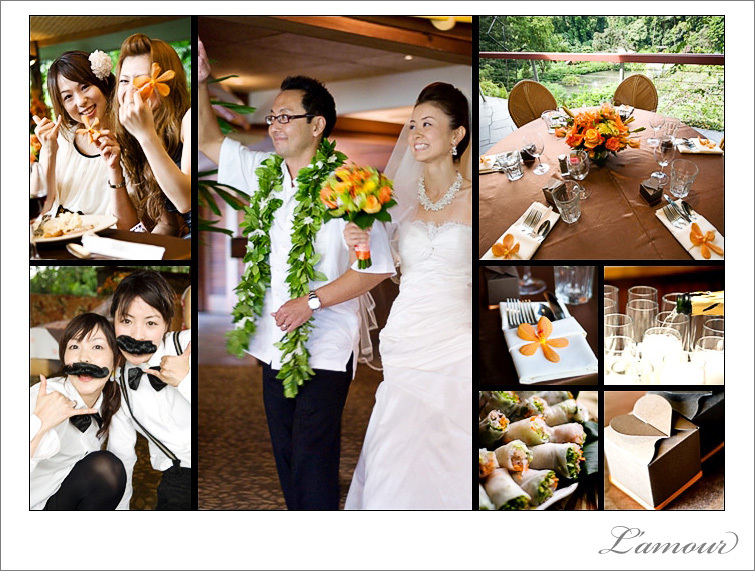 To see another wedding photographed by L’Amour Photography at Haiku Gardens, click here.